When you think about cabinet refacing in Fountain Valley, Cabinet Wholesalers is the company you can rely on. We’ve installed kitchen cabinets in thousands of homes all over Southern California and are proud to offer Signature Cabinet Refacing services to customers like you. Homeowners in Fountain Valley love our unique process that starts with choosing from a selection door styles, stain colors and glazes, and then adding on hardware to make a custom look that matches the style of your home. There’s no need to completely remove your all of your cabinets. With cabinet refacing we only remove your door and drawer fronts, leaving your cabinet frames in place. We’ll create new drawer and door fronts and install them, while also covering your old cabinets with a 1/4″ thick veneer. When we’re done, you’re old cabinets will be covered and will look brand new. 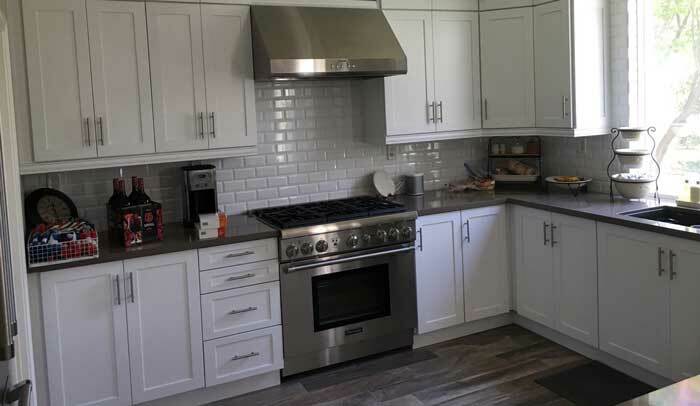 Learn more about the cabinet refacing services Cabinet Wholesalers provides in Fountain Valley and all over Southern California by calling us at 714-693-1111 of stop by our Anaheim showroom and talk to a kitchen design pro.